A certain amount of time is needed for tasks such as signal acquisition and orbit information calculation in satellite positioning. Assisted GPS (AGPS) performs calculations in advance to acquire satellite placement and other information. It sends these results using a mobile or other network to reduce the burden on the device (receiver). This decreases the time for starting positioning, and also offers other benefits such as conserving energy on smartphones or other devices. Satellite-specific orbit information such as satellite orbital radius, eccentricity, and inclination is provided as datasets with pertinent structures. An “almanac” is one dataset for satellite positioning. With GPS, the almanac broadcast by a single satellite includes orbit information for all GPS satellites, which enables rough position estimation and reduces the time needed for initial acquisition. Higher-precision ephemeris data is also transmitted with the almanac. Based on this information, the receiver can more accurately find the satellite’s position at a given second. These names are inspired by The Nautical Almanac and Astronomical Ephemeris, which was published in the late 18th century by the Royal Observatory, Greenwich in the United Kingdom. This type of clock achieves extremely high precision by using the characteristic properties of atoms. It is used globally to define the length of one second as “the length of time it takes for 9.192631770 billion transitions of a cesium atom.” Besides cesium, substances such as rubidium, hydrogen, and strontium are sometimes used. Carrier wave phase information is essential for highly precise positioning. “Carrier wave” refers to the satellite signals transmitted by the positioning satellite. “Carrier wave phase” indicates the phase of the carrier wave among one cycle. The L1 signal used by GPS and QZSS has a frequency of 1575.42MHz, so the wavelength (distance between the wave’s crests) is roughly 19 centimeters. The distance between the satellite and receiver can be expressed in the number of carrier wavelengths (integer + fraction) in units of approximately 19 centimeters. The carrier wave phase is the numerical value that signifies the fraction portion of this representation. It enables significantly more precise positioning than using the pseudo distance. The CDMA method is one digital communications method. It assigns a specific numerical sequence (code) to sent messages, and the same code is used for reconstruction when the message is received. This offers various benefits, such as the ability for multiple devices to use the same frequency at the same time, the ability to withstand noise, and high confidentiality. Today, the CDMA method is a representative communications method that supports mobile phones and wireless LAN. In satellite positioning, the code used when sending and receiving is simultaneously utilized for satellite identification, which helps to precisely measure the satellite signal arrival time. “Differential GPS” (DGPS) is a method for boosting positioning accuracy. Information is received and calculated at fixed ground-based stations, then sent via a mobile network, medium frequency, or satellite simultaneous transmission to a device (receiver). It was previously used to correct GPS selective availability (SA). Today, DGPS provides information related to ionospheric delays and tropospheric correction. Also referred to as “Geometric Dilution of Precision” (GDOP). In satellite positioning, the DOP value increases when a satellite leans toward a specific direction, which leads to reduced positioning precision. Conversely, positioning accuracy is greater when satellites are dispersed evenly in the sky (when the DOP is small). This is a positioning method to use satellite signals with two different frequencies that are transmitted from a satellite. The two frequencies make it possible to analyze the effects of ionospheric delay on satellite signals, so errors can be corrected. Consequently, positioning precision is improved compared with traditional single-frequency positioning. “Elevation angle” is the angle formed by the satellite and horizon. The “zenith” is 90°. The closer to the zenith, the higher the elevation angle. This is sometimes expressed as the “height” of the satellite – the higher the satellite, the better the reception conditions. “Azimuth” indicates the direction of the satellite if true north is 0° and true east is 90°. The position of the satellite as seen from the earth is expressed using its azimuth and elevation angle. Galileo is the satellite positioning system of the European Union (EU). The first test satellite was launched in 2005, and an announcement was made about the launch of initial services at the end of 2016. This system is named after Italian physicist Galileo Galilei. A satellite appears to be stationary from the ground if 1) It revolves in the same direction as the earth’s rotation, 2) Has the same rotation period, and 3) Has the circular orbit, and 4) The orbital plane is the same as the earth’s equatorial plane. This type of orbit is called a “geostationary orbit” (GEO), and satellites on GEO are called “geostationary satellites.” These satellites are frequently used for purposes such as telecommunications and broadcasting because they appear to be stationary, which means receiver antennae can have fixed directions. QZS-3 in the Japanese QZSS is a geostationary satellite. This is the Russian satellite positioning service that is operated with original wavelengths; it is not compatible with GPS. See the "Satellite positioning system" section. This satellite positioning system is operated by the United States, and is used commonly for purposes such as the determination of location coordinates. At all times, more than 30 GPS satellites are going around to cover the whole earth. GPS expresses time using only weeks and seconds. This time system – which does not use years, months, days, hours, or minutes – is called “GPS time.” GPS time was zero at 12:00 a.m. on January 6, 1980 according to Coordinated Universal Time (UTC). One week is counted as 604,800 seconds (= 60 seconds x 60 minutes x 24 hours x seven days). GPS time returns to zero after 1,024 weeks (= roughly 20 years) and its second week rollover was on August 22, 1999. The third week rollover will occur on April 7, 2019 (9:00 a.m. on April 7 JST). UTC is sometimes corrected by adding a leap second, but there are no leap seconds in GPS time. UTC can be obtained from GPS time using a simple calculation based on the information that is sent indicating the number of seconds by which UTC and GPS time differ. In the upper levels of the earth's atmosphere, the layer in which electrons are separated (ionized) from atoms and molecules is the ionosphere. The speed of the satellite signals from satellites passing through this layer is slowed due to the effects of electrons in the ionosphere, so for positioning it is essential to adjust the error according to satellite signal delay. 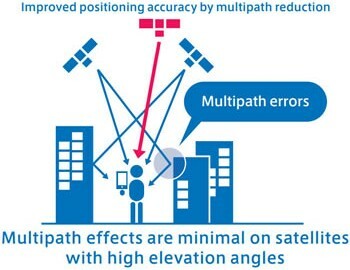 “Multipath” means that satellite signals do not just arrive in a straight line; they are transmitted in multiple routes while being reflected off mountains, buildings, etc. The reflected satellite signals arrive at their destination with a slight delay. The delayed time results in a more distant calculation, so this is one of the negative factors in accurate satellite positioning. The Navigation Indian Constellation (NAVIC) is the satellite positioning system operated by India. It is also called the “Indian Regional Navigational Satellite System” (IRNSS). It consists of geostationary and inclined geosynchronous orbit (IGSO) satellites only. 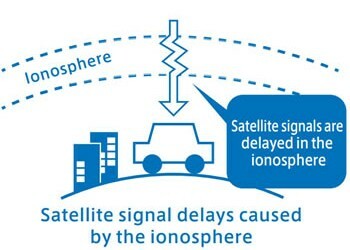 The distance between the satellite and receiver (user), which is acquired based on satellite signal transmission time, is impacted by the ionosphere and atmosphere, and also includes errors stemming from the receiver itself. In satellite positioning, first the rough position is found, then calculations are performed while correcting errors to achieve a more probable value. The term “pseudo distance” refers to the distance that includes error information, which is the start of these calculations. This orbit was determined so that satellites could stand for a long period of time above Japan. On a map of the world, this orbit stretches from Japan to Oceania in the shape of an asymmetrical figure eight, with the top portion (near Japan) forming a smaller circle. This orbit—an ellipse that inclines slightly in response to the earth's rotation—actually goes around at the same cycle as the earth’s rotation. These systems acquire the user’s precise position using 1) Multiple positioning satellites, 2) The ground station to manage the satellites, and 3) The user’s receiver. In general, satellite signals are received from a minimum of four satellites, and the user’s position is found by acquiring and calculating the distance between the user and satellite based on the transmission time. The user can also determine the accurate time together with his or her position. A satellite positioning system is called a “global navigation satellite system” (GNSS). Major GNSS include the American GPS, Russian GLONASS, European Galileo, and Chinese BeiDou. The word “GNSS” is used to refer to all of these. Although the Japanese QZSS is sometimes classified as a regional navigation satellite system (RNSS) because it only covers the Asia/Oceania region, it is also categorized as a GNSS together with the Indian NAVIC in some cases. A satellite-based augmentation system (SBAS) is a system including geostationary satellites for sending augmentation signals. The Japanese Multi-functional Transport Satellites (MTSAT) series is equipped with this functionality. An SBAS uses geostationary satellites, so the elevation angle decreases with a higher latitude, which increases impacts including those caused by obstacles such as buildings and trees, as well as multipath effects. The arrival of satellite signals can be delayed by the effects of atmospheric molecules and airborne water vapor. “Tropospheric correction” refers to the calculations used to cancel these effects. The troposphere is the region of dense atmosphere from the earth’s surface to an elevation of about 11 kilometers. 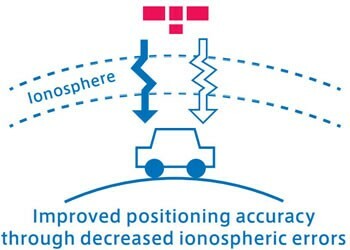 A lower satellite elevation angle means the satellite signal must pass through a longer distance in the atmosphere, so these effects must also be taken into account when performing corrections.